Jerzy Skolimowski’s Essential Killing (2010) opens with helicopter shots of a nearly otherworldly desert with dizzyingly abstract contours – more of a psychoscape than a landscape – through which Taliban (?) 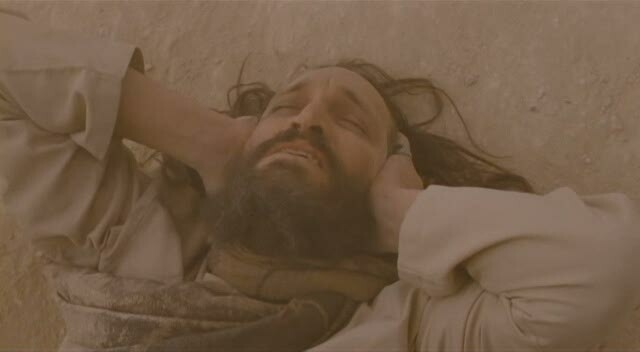 soldier and protagonist Mohammed (Vincent Gallo) maneuvers unsuccessfully. Maneuvering is what Mohammed does throughout the film, as he sneaks out of an American (?) facility and traverses the frozen geography of what seems like Russia (? ), while his memories, fantasies, visions and reality coalesce to form an amorphous psychic force that drives him. (For a film that’s so keen on ‘observing without judgment, this sort of alternate psychoanalysis is threatening if not fatal). The irony here is that Mohammed, supposedly a brainwashed killing machine for whom death translates to martyrdom, is exhibiting the highest forms of survival instinct. And an assortment of this kind of contradictions – behaviour as a negation of ideology – is what Essential Killing aims for. While his ‘mission’ might propel unwaveringly him towards death, Mohammed – now that his imminent death is not entirely of his making as he might have liked it to be – is continuously moving towards a rebirth of sorts, as is suggested by behavioral details such as his inability to speak, walk properly and, well, his drinking of milk from a woman’s breast. While his mission dictates that America is his enemy, he tries virtually to make it his home, blending in with his landscape (as he did in his country in the opening segment), apparently moving ever close to a promised land. Skolimowski might have wanted to counterpoint the dominant image of the Taliban terrorist – like Laura Poitras – with a sober opposite which portrays him as a weakling clinging on to life, but his interminable bout of decontexualization, coupled with his tendency to reduce cinema to a denotative art form, removes any sting from his political stance.